As you are probably aware, it is Explorer Week, over at the Super Villain's website. Now I am not one to quash the adventurous spirit, but I'd like to raise the alarm here. Every photo posted this week has belonged to an ill fated expedition, men whose final hours were dark, cold, and lonely. I suppose that PJM may be trying to lure some of you into attempting spur of the moment jaunts into the frozen tundra equipped with light attire, untrained crews, or lead-lined food tins. This is not the time of year to begin a polar expedition. Remain alert and be prepared. Super Villains should not be trusted. This has been a public service announcement from he who opposes supper villainy (both real or imaginary). o dis gonna mak dat boy real mad. all dis fussen and fuden and all. ders gonna be trubl, i knows it. I's agreed wid Miss Charity. And thanks for the warning, I'll leave my lead-lined food tins at home. 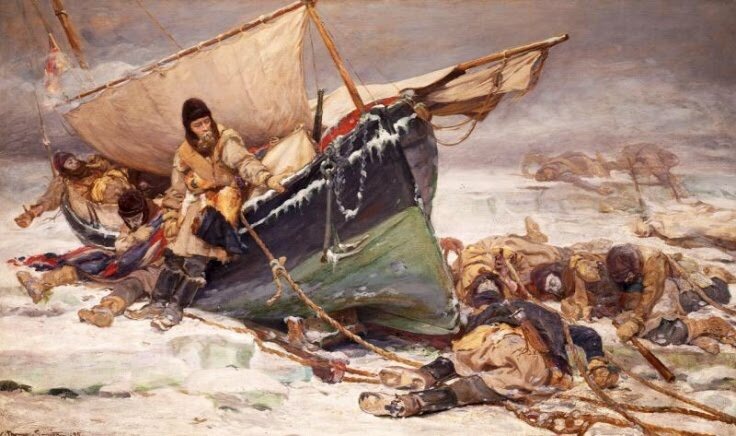 After seeing the painting I’ve read about John Franklins 1845 expedition to find the Northwest passage. Talking about an ill fated expedition, pfff. I didn’t know this story, I only knew about Willem Barentsz who tried to find the Northeast passage in 1596, and had to survive, with 15 men, a winter on Nova Zembla. At least some of those men managed to get back home a year later. So many of the initial polar voyages ended in disaster of some kind or another. The special madness of finding the Northwest Passage made its way into a literary classic: Mary Shelley's "Frankenstein; or, The Modern Prometheus"
Rob, Franklin's lost expedition is a very interesting and tragic story. The British government's rescue efforts were massive, but returned findings that were even more curious. There are hundreds of pages of Eskimo testimony recounting tales of starvation and cannibalism. Franklin's ships are still sought by archaeologists and researchers. In the 1980s, forensic expeditions were sent to hunt for remains to test (for those with a bent for the gruesome, google John Torrington, John Hartnell, and William Braine - there are images of the frozen remains of these three crewmen that were disinterred during the study). The Canadian government continues to fund expeditions, the most recent being in 2008 and this summer. The purpose is not only to solve a historical mystery, but many suppose for the Canadians to assert territorial claims to the ever more likely navigable Northwest Passage. Thanks for the info. Horrible pictures indeed.